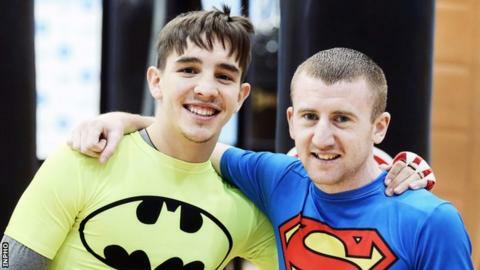 Belfast man Paddy Barnes will clinch his Olympic Games place on Saturday if he beats Venezuelan Finol Rivas in his latest World Series of Boxing contest. Rivas will have home advantage for the bout in Maiquetia as the local Caciques de Venezuela team take on Barnes's Italia Thunder outfit. Light-flyweight Barnes has won his first five fights in the World Series. Michael Conlan could also secure his Olympic berth if he wins his bout against Venezuela's Jose Dias-Azocar. Conlan is currently third in the bantamweight bantamweight standings with the top two guaranteed to earn Rio spots. Victory could be enough for Conlan to secure Olympic qualification if other results go his way this weekend. Barnes is first in the World Series light-flyweight rankings after winning all his fights to date. The top ranked light-fly will qualify for Rio. Barnes won bronze medals at both the Beijing and London Olympics Games. Conlan, who recently celebrated becoming a father, took flyweight bronze at the London Games three years ago before moving up to the bantamweight division. If the Belfast men don't manage to gain Olympic qualification through the World Series route, there will be a number of other avenues open to both to earn progression to Rio.